Biking is loved by millions around the world, but the number of road accidents involving cyclists is unfortunately high as well. Now, thanks to the revolutionary rear-view mirror for racking bikes, mountain bikes and street bikes, riding with the family or friends is both safer and more fun. ConsThe image is very small compared with some of the alternatives. The mirror plugs into a rubber plug, which itself plugs into the handlebar end. The result is a very firm fixing, vibration free, but with limited adjustment. With my handlebar and riding position, I'm at the limit of adjustment. Bought specifically for a tour in France. Did not provide much help as the rear pannier obstructed the most important part of the field of view. ProsEasy fit, neat appearance and not affected by wind. 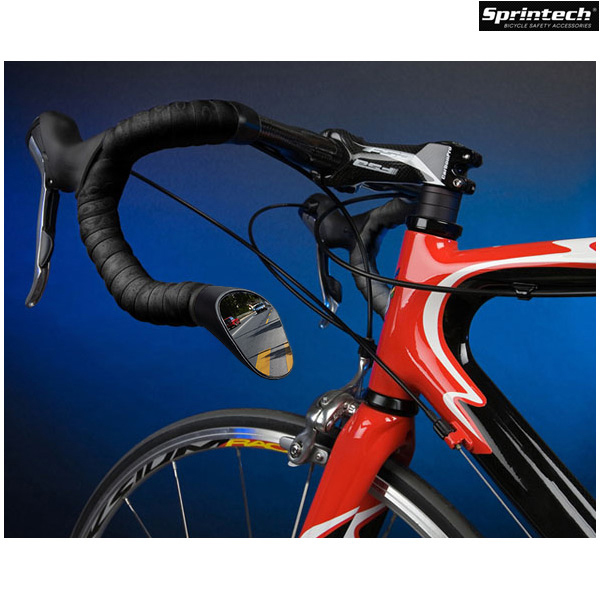 Easy to fit and adjust, gives a good view and looks neat on the bike. Yes, vehicles look smaller, but that's the same with car mirrors and you adjust to the view. great product,very easy to fit and gives so much more confidence when out on the bike i can see the behaviour of cars behind me also how far back my partner is lagging. This mirror is small, light and stable. I had a Blackburn before which was good but eventually became loose and wouldn't stay in position. This has a different mounting system which I think will last longer. It offers a good rear view with low vibration distortion. One aspect to be aware of is it has a diminishing effect so objects look further away than they really are. I always look over my shoulder before changing line which is definitely necessary here. I have had these mirrors for several years. Now the rubber part that fits into the end bars have deteriorated ,could I buy two replacement rubber fittings ? Thank you for your enquiry. We do stock the spare rubber plugs for these mirrors, they are our item number 38416. If you input this number into the search box on the website it should take you straight to them. Hi thinking about buying a mirror is the right hand mirror when you are sitting on the bike as if you are cycling. Sorry for what sounds like a obvious answer but I just don't want to get the wrong one. Our options are all as if you are cycling, so if it is the right mirror you need you would indeed select the right hand mirror.